Johnny Cupcakes is a Boston-based clothing brand started by John Earle, a.k.a. Johnny Cupcakes. They specialize in graphic tees adorned with pop-culture references, spoofs, and of course, cupcakes! Johnny Cupcakes was started over 15 years ago out of the trunk of Johnny’s ’89 Toyota Camry, where he’d sell his novelty collectible t-shirts to those in the know. Today, Johnny Cupcakes is an internationally recognized brand due to its once globe-spanning bakery themed retail stores and strong e-commerce presence. 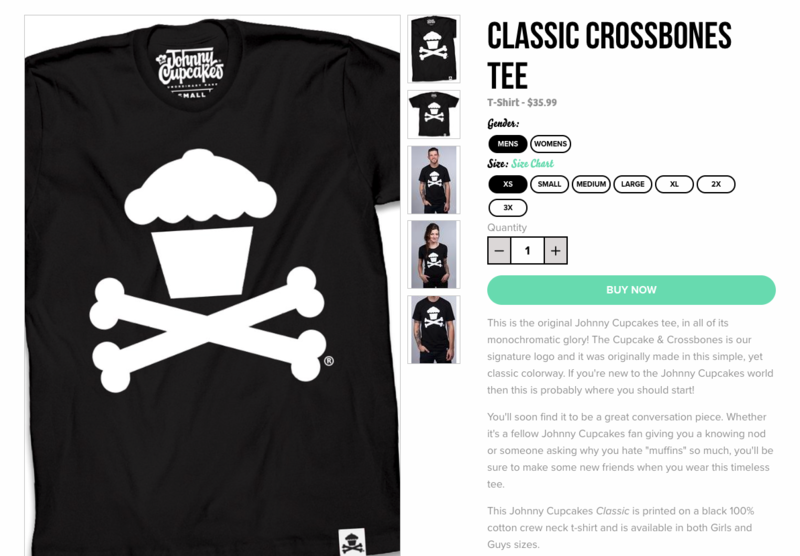 Johnny Cupcakes is a highly sought-after, collectible fashion brand with a following that expands daily. To maintain that status, they need to have a website that is just as fun, inspiring, and carefree as their customers. The design team at Trellis / Growth Spark recognized this, and knew that their site needed to offer an experience that matched and nurtured the culture that was built around the brand. The current site didn't reflect the brand, and they needed to revamp the entire look and feel of the site to reflect their amazing company culture and purpose. The Johnny Cupcakes homepage now acts as a marquee for the various facets of the Johnny Cupcakes brand, from speaking engagements to custom merchandising, and of course highlighted products. This allows visitors to know at first glance just what Johnny Cupcakes has on offer. With a refreshed shopping experience, customers are able to find products fast, thanks to a readily-accessible set of filters. These filters take place of large splash images which previously dominated the upper portion of collection pages on the Johnny Cupcakes Shop. Those splash images kept product “below the fold” and so this was a major improvement to product visibility. Making these changes brought a refreshing, yet familiar experience to the Johnny Cupcakes website leading into 2017. The newest web design for Johnny Cupcakes draws inspiration from an eclectic mix of sources that are all dear to the hearts of their most loyal fans: startup brands, online documentaries, independent bands, and artists.